How does the designer of the sold-out Provoke catalogue conceive of new photobooks? of important self-published titles. From that point onward, I’ve followed his work and—full disclosure—we have since collaborated on several projects together. Most notably, we cocurated the exhibition Open Book (2014) for Paris Photo, which attempted to break down the longstanding barrier between the histories of artists’ books and photobooks, and document and visualize the hidden influences between the two. I remain fascinated by Hourquet’s wide interests in film, music, art, and photography, and by how he manages to bring them together in his work. In 2013, Hourquet created Temple Gallery and Editions, which he runs with his partner, Anna Planas. Their regular exhibitions feature young photographers in a small but well-thought-out and organized space in the Marais, Paris. Each exhibition is accompanied by a small publication conceived for the occasion. Hourquet is currently working as a curator for The Hobbyist, an exhibition that will open at Fotomuseum Winterthur this September. Sebastian Hau: What is the specificity of a photobook? Pierre Hourquet: You can look at a book as an intimate object—the polar opposite of an exhibition. You can look at them longer and harder, without distractions, and return again and again. As a designer, I also like to consider books as containers, as specific spaces. SH: Is a book an end in itself, or is it connected to other forms of expression? PH: A book is not an end in and of itself. It’s a useful tool. At Temple, our publications are complementary to the exhibitions, but they’re also starting points. With Sonia Berger, we launched the collection “A Companion To,” related to some books that the Spanish publisher and bookshop Dalpine had published. Books make connections. They can share ideas and messages. They contain great educational and cultural potential. SH: What’s the first thing you do when you see photographs you will work with? What’s the last? PH: First I try to learn more about the work, looking for other books, interviews, or articles about the artist. I designed a book for Lewis Baltz for his exhibition at LE BAL. He was very sick at that moment, so we could not meet often. The first thing I did was watch all the films he had selected for the show from filmmakers who inspired him. It was really helpful for understanding his work and designing his book. When I showed him the final book, Common Objects (2014), he remarked with gentle irony that he couldn’t tell whether it was an artist’s book made by him or by me. That was an ambiguous compliment, but put forth in a very warmhearted way. Another important thing is to create a structure for the book. For the Provoke catalogue, the first thing I did with Diane Dufour, the director of LE BAL and cocurator of the show, was organize everything. However, she also wanted to add more books and photographs to the initial selection of content. We were looking at more and more material and, as a result, we reconceived the structure several times! The final book holds more material than the actual shows. The last thing I do? The book cover! 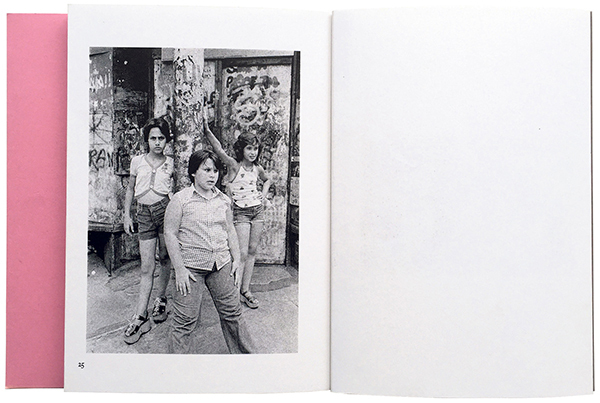 SH: Can you describe the process of working on Susan Meiselas’s Prince Street Girls (2013)? PH: I was experimenting with making books with a group of friends. We called ourselves Yellow Magic, inspired by the Japanese [music] group Yellow Magic Orchestra. We had already organized a printing show for Daido Moriyama and made a special book project for him. Susan had selected some images from the Prince Street Girls series for a solo show she had in a Parisian gallery. She wanted to make a small publication. One of her assistants had designed a very basic dummy, which she showed me. We kept the idea of a simple zine and made a more sophisticated version for Susan. It was the second book made by our group. We designed it, printed it, bound it, and sold it on our own. We assumed the responsibility for the whole process. A great performance! SH: Do you find your work on book projects is changing over the years? the time we were showing works that had not been published before. SH: What are your ideas about the relationship between words and images in books? PH: For each project, I try to find the right relationship between text and images, even if there are only captions. With Yellow Magic, we tried to make a book project with a text from Jean Giono (The Man Who Planted Trees, 1954) and images from Robert Adams. The hardest thing was not putting images as an illustration of the text. We wanted to build a book where images could be readable as text—to find a narrative sequence where text and image were joined in a general story. Although Robert Adams likes the text by Jean Giono very much, in the end we didn’t manage to find the balance between these two languages—the first project we couldn’t finish. SH: You work with both physical dummies and digital design tools. Can you explain the role of these techniques and how they come together? PH: Even if I spend most of my time designing and working with files on my computer, I still like the materiality of the dummy. You cannot make a book without doing a paper dummy. It gives you a preview of the object you will get at the end. Digital tools bring technique, exactitude, and precision to the project. However, I have often done dummies without digital tools, made only with photocopies and Scotch tape. I like the raw aspect of them. SH: You have published around seventy books yourself, online, with Temple, and as fanzines. How do you feel about the difference between self-publishing and publish- ing in general? a book by yourself. We publish books at Temple in this spirit of independence. I also like the urgency of self-publishing: you have to do something, so you do it. Sebastian Hau publishes, curates, sells, writes about, and teaches classes about photography and photobooks. In collaboration with Olivier Cablat, he organizes the photobook fair Cosmos for the Rencontres d’Arles, as well as the photobook fair Polycopies Paris with Laurent Chardon. More on Pierre Hourquet’s work and his collaborations can be found at templeparis.com and booksonline.fr.